Each year TripAdvisor awards a Certificate of Excellence to hotels that have received excellent reviews from their guests. Only 10% of all the hotels represented on TripAdvisor have been given this honour. 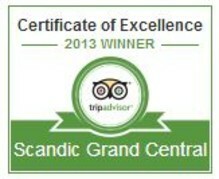 Forty of Scandic’s hotels have now received a Certificate of Excellence, accounting for almost 26% of Scandic’s portfolio.